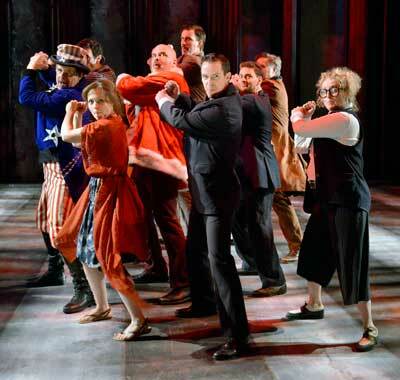 An unlikely musical about a gaggle of assassins – successful and attempted – of American presidents. Take a whole group of characters like John Wilkes Booth, Lee Harvey Oswald, Squeaky Frome, Sara Jane Moore, John Hinckley, add some wry dialogue between them with a few songs, and then happen to be Stephen Sondheim and you may get this produced. It was produced, at first Off-Broadway, in 1990, then in London, and then eventually made it to Broadway in 2004, but, though drawing the interest of devoted Sondheimians, was never a tremendous commercial nor critical success. This is weaker than average Sondheim. It shares something with his great Sweeney Todd (1979) – a distinct grimness of subject-matter – but there is something in Sweeney Todd which really tells a story in the way that Assassins does not. Through a multitude of very small stories about each assassin it tries desperately to create a singular narrative, which does not really work. One comes away with not too much feeling for the bulk of the characters nor much of an understanding about what the show as a whole intends. Assassins shares with another of Sondheim’s less popular ventures, Pacific Overtures (1976), a kind of abstract quality. Rather than being about characters and their interactions, it’s more about a general theme. In Pacific Overtures, the theme is the West’s incursion into Japan in the 19th century. In Assassins the theme is the murderous temperament. Both scripts convey a general interest in surveying their subject matters, but don’t quite succeed in personalizing them. While songs in both shows are appealing and one sympathizes with the attempt to wrestle with somewhat difficult subject-matters, there is something generally lacking in their narrative frameworks. There is a good amount of talent at work in this well-intentioned production. Benjamin Evett, who plays the omnipresent Proprietor, is a versatile and capable actor who last season demonstrated that he had a singing voice when he came out of vocal seclusion to perform as Arthur in the New Rep’s Camelot. In that, his voice was, like Richard Burton’s in the original, a kind of sonorous speech-singing that worked very well. Here, the challenges of Sondheimian tonalities make the effort more significant. Though the sonority in Evett’s voice comes through, there are places where a seeming absence of more specialized vocal training manifests itself. 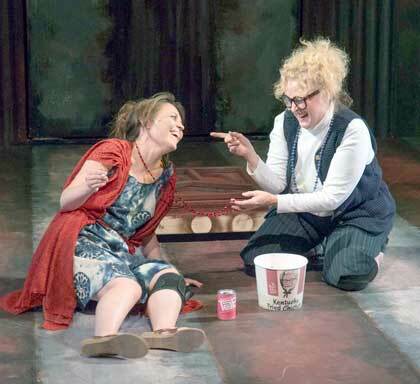 McCaela Donovan, who has a superb singing voice, has a mostly humorous non-singing role as Squeaky Fromme. She’s not bad in the role, but unfortunately the book and score do not give her much opportunity to use that great voice. Evan Gambardella, as the Balladeer and Lee Harvey Oswald, has a delightful tenor that shines in most of the occasions when he sings, which is quite often. He revitalizes things when he takes center stage, bringing focus into a show which, because of its general amorphousness of content and structure, has a tendency to fall apart at the seams. Peter S. Adams, who plays Samuel Byck -who attempted to hijack a commercial airliner and crash it into Nixon’s White House in 1974 – has one of the more vivid narratives. He actually gets to tell some of his tale and is convincingly nutty in a down to earth way. That seems to be where Assassins wanted to go, but it winds up being too all over the place, a kind of grab bag that tries to bring together murderers in the way that Into The Woods (1986) tries to bring together fairy-tale characters. In Into The Woods, it works, because the extrapolations of witches, giants and princes actually create a story. In Assassins, a bunch of potentially interesting characters bang up against one another on stage, but never interact enough, nor tell us enough about themselves, to convey a coherent tale.